n’s critics as ‘an effete corps of impudent snobs’. Just as it seems that the entire world was falling apart, the astronauts on Apollo 8 – the first manned spacecraft to orbit the moon – take a photograph that will forever change humanity’s image of the planet it inhabits: Earthrise – planet Earth as seen from space. Radiant, alive, infinitely beautiful, awash with oceans, swathed in clouds. The picture will later be called ‘the single most influential environmental photograph ever taken’. 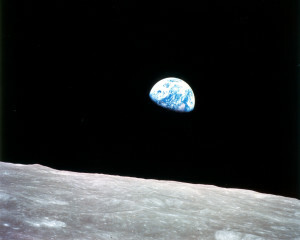 The image is seen on Christmas Eve 1968, by the largest TV audience of the time. As the Vietnam War escalated throughout the 1960s, over a million draft resisters and deserters fled the US. 150,000 of them went to Canada in the largest single political exodus in US history. Among them were the Quaker pacifists Irving and Dorothy Stowe, from Providence, Rhode Island, and Jim and Marie Bohlen from Pennsylvania. One Saturday morning in the spring of ’68 the Bohlens attend an anti-war demonstration on the lawn of the Provincial Court House in Vancouver. Knowing almost nobody there, they looked out for fellow Quakers and introduced themselves to the Stowes. The four soon became devoted friends and were among the charter members of the new British Columbia chapter of the Sierra Club. On 29 September, a demonstration to protest the nuclear bomb test was organised at the US Consulate in downtown Vancouver. Bob Hunter made placards for the protest and came up with the slogan ‘Don’t Make a Wave’. Also attending this protest were Bob’s wife Zoe Hunter, Irving Stowe, Ben Metcalfe, Paul and Linda Spong and several others who would eventually form the core of Greenpeace. Journalist Ben Metcalfe – on his own initiative, and at a cost of $4,000 – had previously been responsible for placing 12 billboards around Vancouver that declared, ‘Ecology? Look it up! You’re involved.’ Spong had been hired by the University of British Columbia and the Vancouver Aquarium to study the first captive Orcinus orca, Skana. 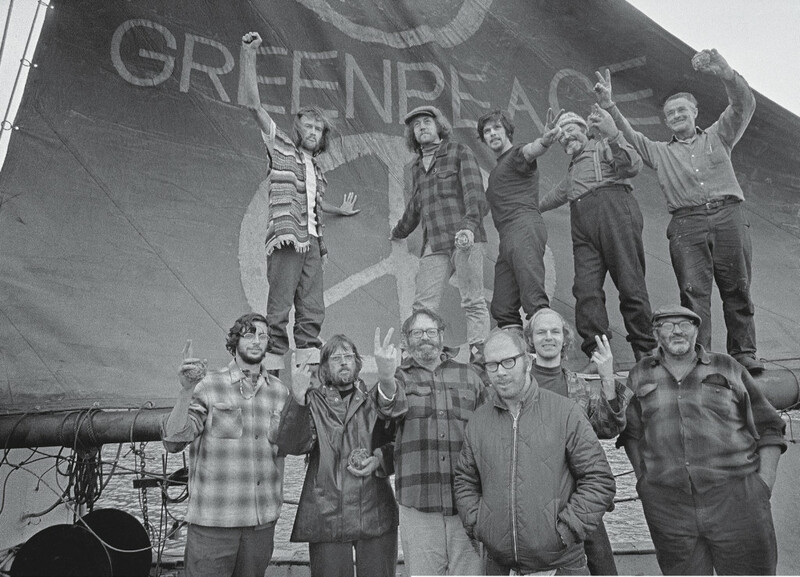 Spong’s experience with the whale converted him into a full-time advocate for whales, and one day the Spongs’ passion for whales would change the face of Greenpeace and the environmental movement. The same group who had gathered at the US Consulate blockaded the highway at the US-Canadian boarder a couple of days later. Irving and Dorothy Stowe held the Quaker banner, and others brandished their ‘Don’t Make a Wave’ signs. That night, the Milrow blast was detonated 4,000 feet below the surface of Amchitka Island, registering a Richter 6.9 shockwave. When the US Department of Defence announced in November that a 5-megaton thermonuclear test – ‘Cannikin’ – was scheduled for Amchitka in the fall of 1971, Irving Stowe formed a group to protest this bomb. Dorothy Stowe recruited the BC Association of Social Workers and Deeno Birmingham from the BC Voice of Women. Jim and Marie Bohlen and Terry Simmons from the Sierra Club joined. Bohlen recruited Paul Cote, a law student he met at the border blockade. Borrowing the slogan coined by Bob Hunter, Stowe, Bohlen and Cote became directors of the Don’t Make A Wave Committee. Stowe recruited Hunter, Metcalfe, Bill Darnell and Rod Marining, all of whom were working on similar projects. As working journalists, Metcalfe and Hunter were the most prominent ecology voices in Vancouver, at the CBC and The Vancouver Sun. Bob Cummings, writing for the radical underground Georgia Straight, also helped promote the cause and joined the group. The Committee met at the Stowes’ house to plan their protest at the Amchitka tests, but its consensus process could often result in long debates and slow resolutions. This particularly frustrated Jim Bohlen, whose wife Marie asked him one February morning why they didn’t simply send a boat to Amchitka. At the same moment the Vancouver Sun called, to ask what campaigns the group was planning. Caught off guard, Jim said “We hope to sail a boat to Amchitka to confront the bomb.” The newspaper ran the story the following day, announcing the plan as a Sierra Club campaign. The name ‘Greenpeace’ quickly caught on. On 15 February 1970, the Vancouver Sun ran the story about the intended voyage – dropping the Sierra Club reference but mentioning a boat to be called ‘the Greenpeace’, the first time the word appeared in print as a single word. Marie Bohlen’s son, Paul Nonnast, designed the first button with the ecology symbol above, the peace symbol below, and in the middle, the single word: Greenpeace. The Don’t Make A Wave Committee published the first ‘Greenpeace’ pamphlet in March 1970, written by the 71-year-old Lille d’Easum, an executive of the BC Voice of Women. Although the Committee had unanimously ratified the idea of sailing to Amchitka to protest the nuclear testing, it had neither a boat nor the money to charter one. Stowe hit upon the idea of organising a concert to raise funds for a boat. The concert would feature Joni Mitchell, James Taylor, Phil Ochs and Chilliwack, and it raised $17.000. The Sierra Club and Quaker groups in the US also contributed towards the fund. In the meantime, the search for a suitable boat was on. Paul Cote met the 60-year old Captain John Cormack on a Fraser River dock, and Cormack agreed to use his fishing boat, the Phyllis Cormack, named after his wife, for the voyage. Hunter, Metcalfe, Bohlen, Darnell and Simmons formed the activist core of the boat crew. Underground journalist Bob Cummings, ecologist Patrick Moore, engineer Dave Birmingham, medical doctor Lyle Thurston, and photographer Robert Keziere joined them. When Marie Bohlen decided to stay ashore, Lou Hogan and Rod Marining stood next on the waiting list. Marining deferred to Hogan, believing that a woman should be on the boat, as did Hunter and Metcalfe. In the end, Richard Fineberg, who had met Bohlen in Alaska, joined the crew instead of Hogan. The Phyllis Cormack, rechristened Greenpeace for the voyage, departed Vancouver on 15 September 1971. Throughout the voyage, Dorothy Metcalfe served as the primary media link, via radio in her home. Dorothy told her husband how support for their action was stretching across Canada and the US, ranging from radical ecological groups to members of Nixon’s own cabinet. She told him how the United Church of Canada had sounded church bells across the country asking the US to cancel the tests. She also told him that the Don’t Make a Wave Committee had now been able to raise money to launch a bigger and faster ship to Amchitka, the Canadian minesweeper Edgewater Fortune; a second boat was now waiting in the wings. The Phyllis Cormack’s crew went ashore at Alert Bay and then continued to the Gulf of Alaska. They were refused entry to Dutch Harbor, to stock up on fuel and supplies, because it was a military base. Instead they anchored off the island of Akutan; they received a message here that the tests had been delayed, but nobody knew for how long. They decided to leave Akutan on a scouting trip to Amchitka, but on 30 September, they were approached by the Coast Guard cutter USS Confidence. Commander Floyd Hunter came aboard and announced that the Phyllis Cormack was under arrest; the crew had failed to notify customs officials of their arrival in Akutan and were ordered to the Shumagin Islands – away from Amchitka – to clear customs there. However, the Confidence’s crew handed over a document, signed by 18 crewmembers, recording their support for the protest: DUE TO THE SITUATION WE ARE IN, THE CREW OF THE CONFIDENCE FEEL THAT WHAT YOU ARE DOING IS FOR THE GOOD OF ALL MANKIND. IF OUR HANDS WEREN’T TIED BY THESE MILITARY BONDS, WE WOULD BE IN THE SAME POSITION AS YOU ARE IN IF IT WAS AT ALL POSSIBLE. GOOD LUCK. WE ARE BEHIND YOU ONE HUNDRED PERCENT. At 1.00 on the afternoon of 6 November, a 4-3 vote allowed the test to proceed. Five hours later, the 5.2 megaton hydrogen bomb was detonated 5,875 feet below the surface of Amchitka. The blast created a molten cavern inside the rock and blew a mile-wide crater on the surface that filled with water and became known as Cannikin Lake. Radioactive krypton gas leaked from the fissured rock, military buildings collapsed, roads cracked wide open and 40,000 cubic metres of granite crumbled from shoreline cliffs. Seabirds nestling on the rocks were killed instantaneously and the skulls of thousands of sea otters were split open. The shock wave registered 7.2 on the Richter scale, becoming the largest human-made earth tremor in history. Because the Phyllis Cormack had never reached Amchitka, and the presence of the Edgewater Fortune had not deterred the US authorities, the Greenpeacers thought that all of their efforts had ultimately proven futile. But this was far from the case – public opposition to the tests was now so massive that disarmament campaigners believed the US might not even attempt to complete its scheduled tests. In the age ushered in following the publication of Earthrise, the world had – quite literally – seen itself for the first time, and it cared. The Greenpeace mission had drawn attention to something the world was no longer willing to tolerate. It was about the ecology, and this time everybody wanted to be involved.